A research team led by Prof. LI Haiyang from the Dalian Institute of Chemical Physics (DICP) of the Chinese Academy of Sciences and Prof. LI Enyou from the First Affiliated Hospital of Harbin Medical University released a novel blood propofol analyzer to measure the propofol concentration in blood. The new instrument is based on dopant-assisted photoionization ion mobility spectrometry, which can measure the propofol concentration in one minute using only one drop of blood without any sample pretreatment. Anesthetist are able to monitor the physical conditions of patients during operation with this new instrument. The novel blood propofol analyzer has passed an independent third-party evaluation by the Affiliated Hospital of Hirosaki University. During the evaluation, the analysis procedures, sampling process, software and the quality control procedures were verified. Both the accuracy and the speed of measurements could meet the requirements for intraoperative application. The evaluation confirmed the intraoperative measurements and the analyzer is ready for clinic applications. “I am expressed my strong desire to develop AI anesthetic machine with this research team based on their novel ion mobility spectrometer.” said Prof. Hirota who is the director of Anesthesiology Department of Hirosaki University and also the host of the evaluation. 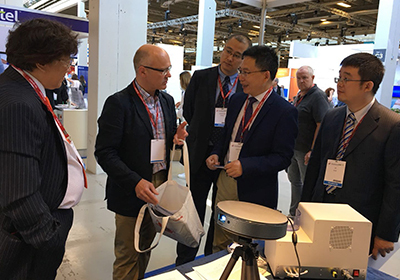 The novel blood propofol analyzer was first exhibited in the annual conference of European Society of Anesthesiology (ESA 2018) in Denmark-Copenhagen. And it attracted attentions of the anesthetists and companies from more than 80 countries. 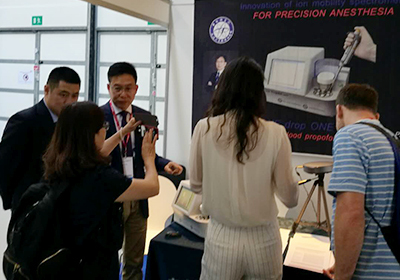 The research team submitted 52 patents for the new analyzer including the measuring principle, sampling and ion mobility spectrometer, and 15 patents and 4 software have been issued.